As we wind down this October, I’m back with another film analysis post, this time of the suspense thriller Double Jeopardy (1999), starring Ashley Judd and Tommy Lee Jones. There are so many factual errors in that plot synopsis alone. I won’t go into them here; check out the IMDb.com Goofs page for the film. There are no actual reel librarians in this film, landing it in the Class V category. However, there are a few research scenes that I found interesting, so let’s dig in, shall we? Since Libby’s been in prison the last 6 years, she’s not used to computers or concepts such as email. (Remember, this film was released in 1999.) She even says to a young man who stops to help her out on the computer that “Someone said I should try the internet.” I also really hope that “someone” was NOT a librarian! This young man asks her a few questions — essentially doing a “reference interview” although it is clear that he is NOT a reel librarian. How do I know that? His role in the credits is listed as “Handsome Internet Expert,” hah! 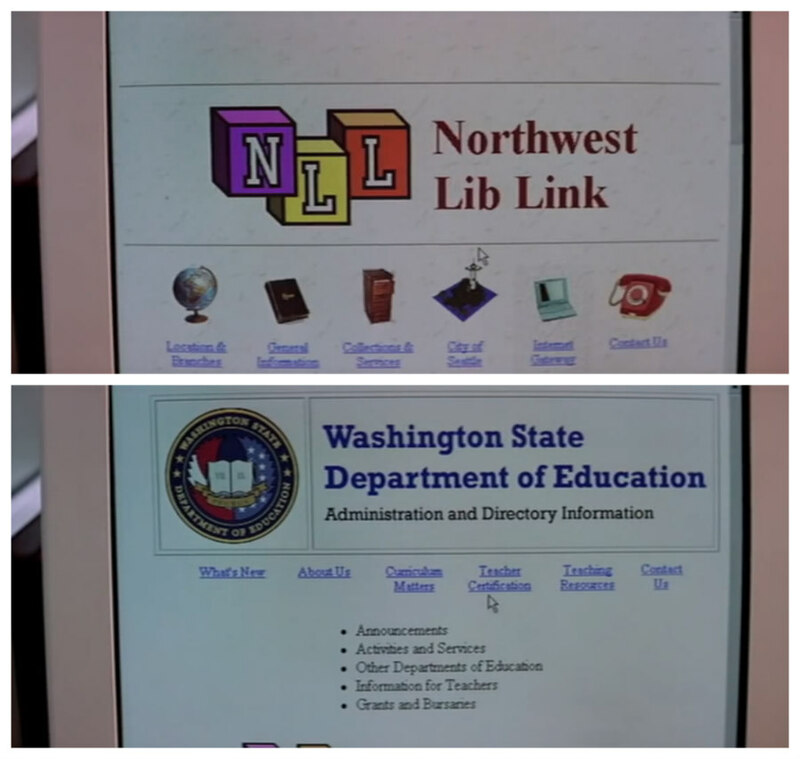 After learning that her friend was a school teacher, he recommends that they start at the Washington State Department of Education directory site. Bingo! Note: There is no “Washington State Department of Education,” so this is a factual error. The Washington state educational agency is called the “Washington State Office of Superintendent of Public Instruction,” otherwise known as OSPI. After getting what she needs, Libby expertly sends the guy on his way by revealing that she had been convicted of murdering her husband. Buh-bye! This library scene, with nary a reel librarian, lasts a total of 2 minutes. It is effective in helping Libby locate her friend, which gives her the next clue in tracking down her husband. Remember when websites used to look like this?! You can view the entire library research scene below. 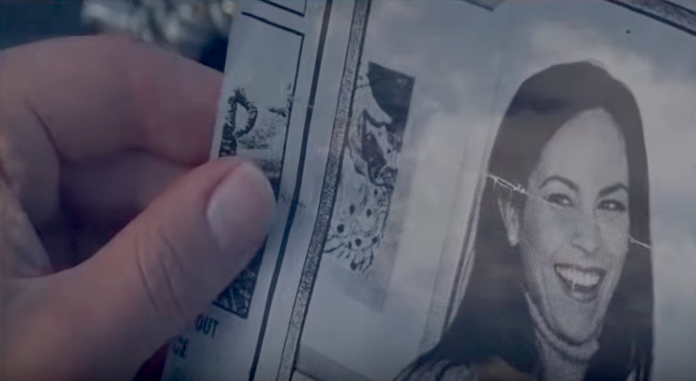 Fifty-eight minutes into the film, we next see Libby researching the death of her friend — she suspects at the hand of her husband! — by using microfilm in a local newspaper’s archives. It’s funny, Libby seems much more comfortable using microfilm than she did using a computer. That subtle body language is a nice touch. You can tell it’s a newspaper archives room because in the foreground, you can see newspapers being printed. A microfilm machine? Finally, something she knows how to use! This scene lasts less than 30 seconds, but it provides a clue that leads Libby to the next step. In the photo used in the newspaper story about her friend’s death, Libby recognized a painting in the background. Below is a “then and now” collage from how the site (supposedly) looked in 1999, and how it looks now. This art research scene lasts only a couple of minutes. different research locations, including a public library, newspaper archives, and an art gallery. And each time, the research leads to vital clues that lead Libby to locating her husband and child. Double Jeopardy. Dir. Bruce Beresford. Perf. Ashley Judd, Tommy Lee Jones, Bruce Greenwood, Annabeth Gish. Paramount, 1999. “Double Jeopardy (1999).” IMDb.com, Accessed 30 Oct. 2018. “Washington State Office of Superintendent of Public Instruction” via Wikipedia is licensed under a CC BY SA 3.0 license. 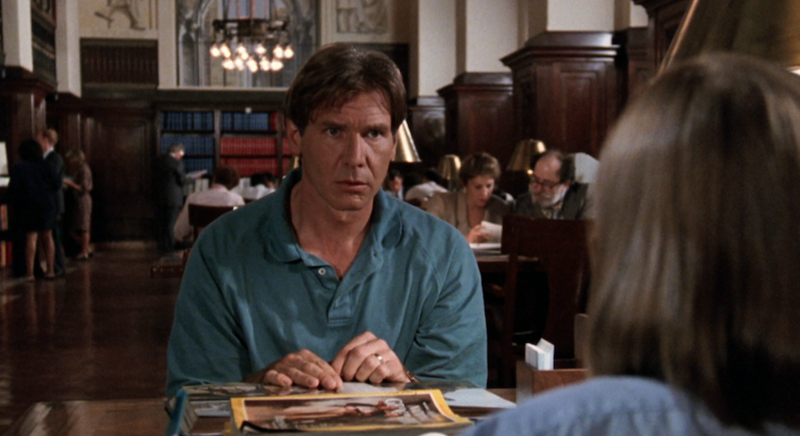 Last week, we looked at Indiana Jones and the Last Crusade (1989), in which Indiana Jones praised the library, stating, “Seventy percent of all archeology is done in the library. Research. Reading.” This week, let’s take a look at Indiana Jones and the Kingdom of the Crystal Skull (2008) and a library scene in which Indiana Jones completely contradicts himself. A little over a half-hour into the film, Indiana Jones meets with “Mutt” Williams (Shia LaBeouf), a guy with a chip on his shoulder the size of his motorcycle. Indy jumps onto the back of Mutt’s motorcycle to escape from Russian agents who are after him. To finally shake off the agents, they motor into… what else? The library! Why wouldn’t you drive into a library to escape Russian agents?! Although this scene lasts just under a minute total, Spielberg makes the most of it. This exterior of the library scene was filmed outside Yale University’s iconic Sterling Memorial Library, standing in for Indiana Jones’s fictional Marshall College library. The interior of the library scenes were actually filmed in Yale’s dining hall! Everyone is stunned to hear a noise in the library, let alone a motorcycle! What’s that noise? A motorcycle in the library, what else? Slow down, save the books! Fun fact: This student in the library is played by Chet Hanks, the son of Tom Hanks and Rita Wilson. Student in Library: Excuse me, Dr. Jones? I just had a question on Dr. Hargrove’s normative culture model. Indiana Jones: Forget Hargrove. Read Vere Gordon Childe on diffusionism. He spent most of his life in the field. If you want to be a good archeologist, you got to get out of the library! … and I have a dumb answer. BOO. Boo, I say. BOO. And I am not the only one incensed by this scene and total about-face for Indy’s view of the library and its vital role in research and archeology. Do you like Crystal Skull? I don’t, at all. 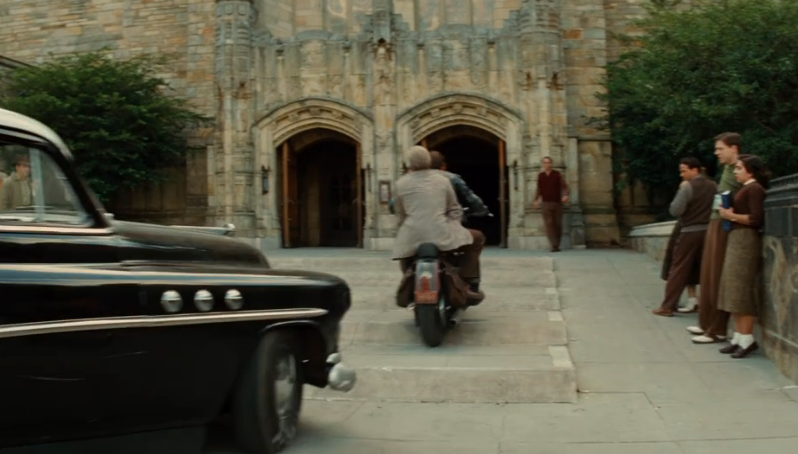 One of the reasons I feel it must be non-canonical is Indy’s dissing of libraries after his motorbike ride through Yale’s Sterling. The real/reel Indiana Jones would never say ‘If you want to be a good archaeologist, you’ve got to get out of the library’! I love Colin’s wording here, that (1) this film in the series is non-canonical because of its treatment of libraries, and (2) “dissing of libraries” is totally not in Indy’s character. Agreed on both counts! So. Indiana Jones not only contradicts himself — and one of the primary messages and themes from the previous film — he GETS IT WRONG. 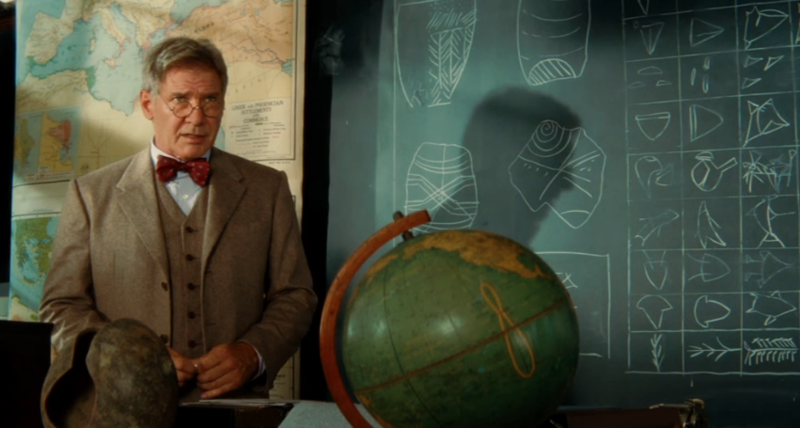 Indiana Jones and the Kingdom of the Crystal Skull ends up in the Class V category, as there are no reel librarians identified or distinguishable from all the other people in the library scene. 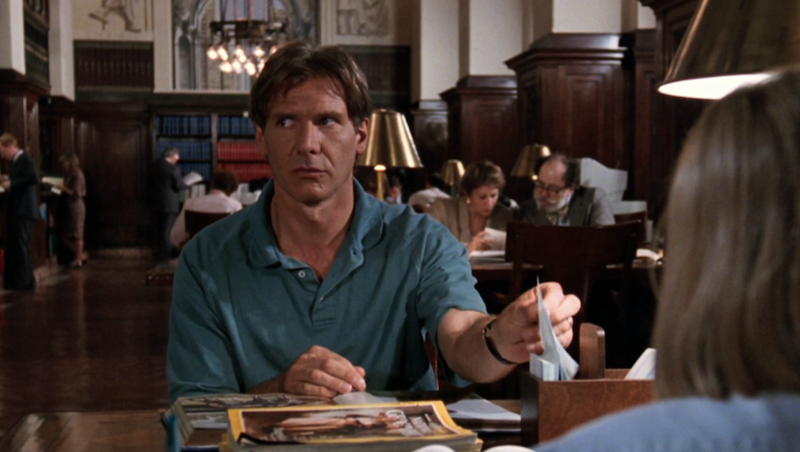 What are your thoughts about this film in the Indiana Jones series and this library scene? Please leave a comment and share! Indiana Jones and the Kingdom of the Crystal Skull. Dir. Steven Spielberg. Perf. Harrison Ford, Shia LaBeouf, Cate Blanchett. Paramount, 2008. “V. 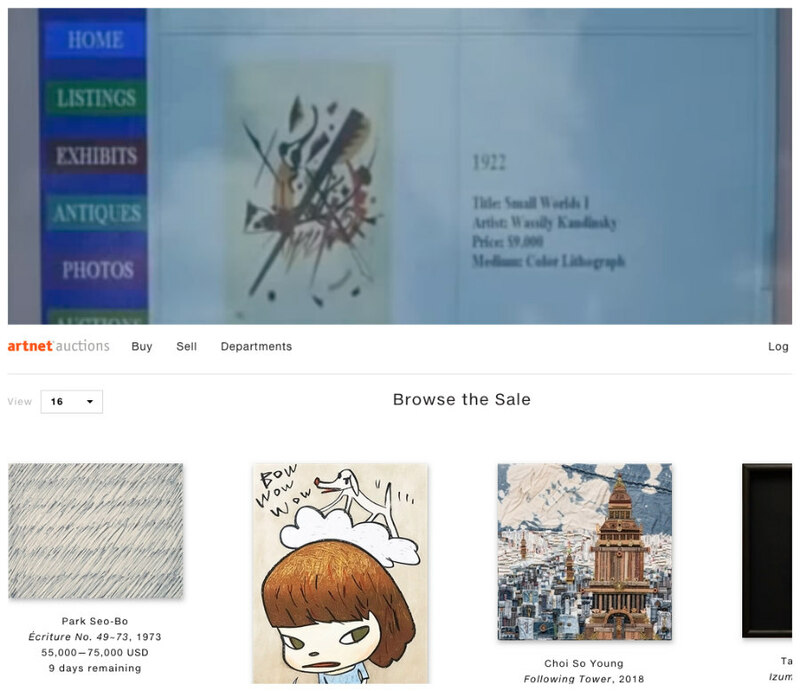 Gordon Childe” via Wikipedia is licensed under a CC BY SA license. In the 1991 film Regarding Henry, directed by Mike Nichols and written by J. J. Abrams (! 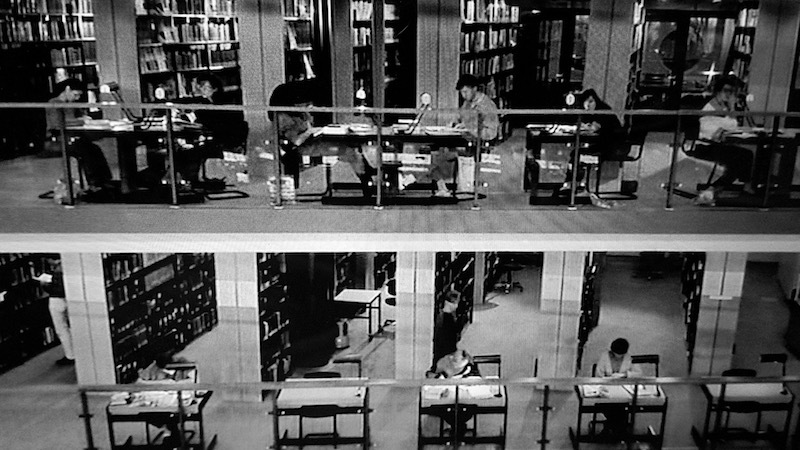 ), a library scene takes place almost exactly halfway through the movie. But first, let’s set the context. Harrison Ford plays the title role, a hot-shot and ruthless New York lawyer who is out of sync with his 12-year-old daughter, Rachel, or his wife, Sarah (played by Annette Bening). One fateful night, Henry gets shot by a kid holding up a corner store, a shot that causes brain damage. When Henry wakes up, he has to figure out how to start all over again — including the basics of movement and speech — including getting to know his family again. “Regarding Henry – Trailer,” uploaded by YouTube Movies, 2012, Standard YouTube license. The library scene — over 10 seconds of it! — makes the trailer, at 1:45 seconds into the clip above. Rachel takes her father to the library, and she explains the basic rules of the library on the walk there. Rachel: Some of them [books] you can borrow and take home, but some of them you have to read here. Henry: And you can’t talk loud. The camera then pans quickly through the library, following the polished floors and atmosphere so quiet you can hear every step of every shoe and squeak of every chair. Every table is occupied, showcasing a variety of people. Henry’s daughter is working and studying, writing in a notebooks. A stack of National Geographic magazines are on the table in-between father and daughter. (It isn’t clear if the magazines are for Henry or for his daughter.) There is also a large photography book open in front of Henry. Henry then starts throwing wads of paper from a box of call number slips, crumpling them up, and then flicking them at his daughter. (This is the part of the scene that makes the trailer.) The sly expressions on Harrison Ford’s face make this scene a(n initially) comic one. The library is VERY serious. But the third time he flicks a paper wad at her, Rachel cracks a smile. But then this short scene turns serious. Rachel: [Realization dawning on her face] I’m sorry. Rachel’s mother no doubt hid a lot of the details about Henry’s recovery from her daughter, including details about how he had to painstakingly learn how to speak and walk again. It never occurred to Rachel — or the audience?! — until that moment in the library that her father no longer remembered how to read. This realization then leads to Henry’s daughter teaching him how to read again. This is significant because he had always put pressure on his daughter to be smart and self-reliant and grown-up; this friction had caused emotional distance between them. Henry being able to admit weakness to his daughter helps them bond again. It’s a poignant scene. And that this discovery — that Henry can’t remember how to read — is made IN A LIBRARY makes this scene even more poignant and memorable. Although memorable, this scene lasts less than two minutes. No librarian is visibly present in the scene. Theoretically, one of the several people in the background could be a librarian, but there is nothing obvious — like, say a prop like a book cart — to make this connect visibly clear for the audience. And no librarian is needed in this scene; rather, the focus is on the relationship between father and daughter. 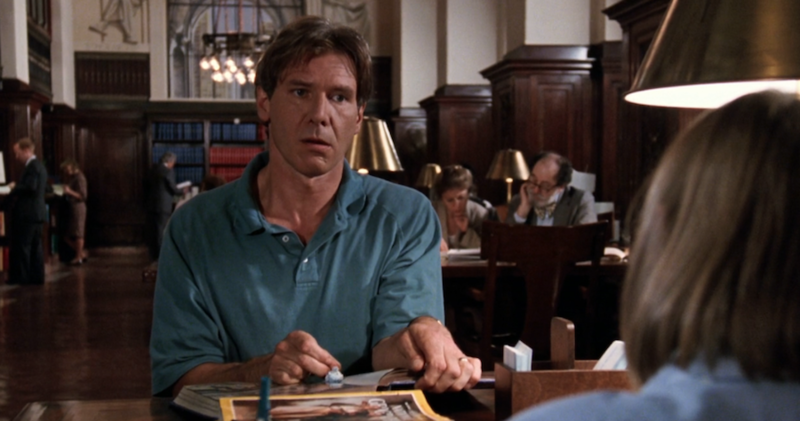 Therefore, Regarding Henry lands in the Class V category, films with no identifiable librarians, although they might mention librarians or have scenes set in libraries. The filming locations mentioned in its IMDb page are very general — it was filmed in New York City — but luckily, an internet search turned up the “On the Set of New York” site. This site’s page for Regarding Henry reveals that the library scene was filmed at the 5th avenue branch of the New York Public Library. This turns out to the iconic central, or main, branch of the library. 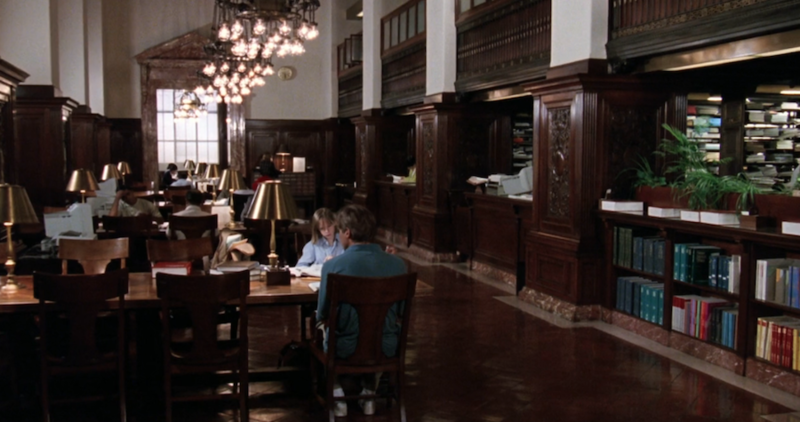 Kudos to director Mike Nichols for finding a way to make the library space in this scene look more cozy and warm than the usual cinematic shots of the NYPL central branch. “Regarding Henry (1991): Filming & Location.” IMDb.com, n.d. Regarding Henry. (1991). Dir. Mike Nichols. Perf. Harrison Ford, Annette Bening, Rebecca Miller. Paramount Pictures. 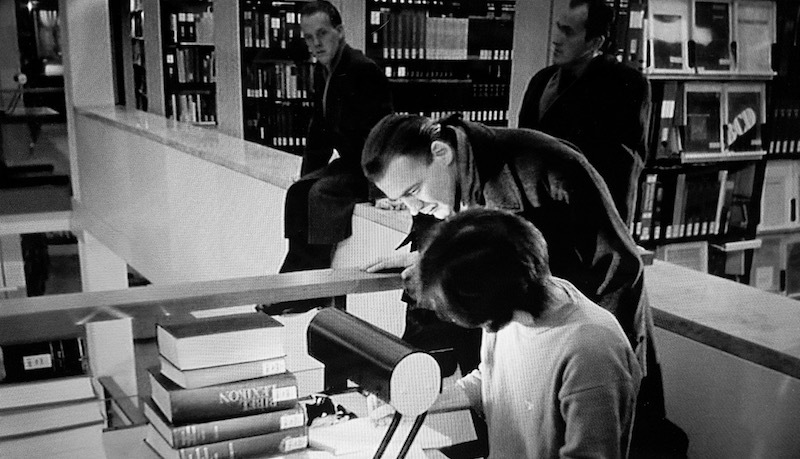 “Regarding Henry (1991).” On the Set of New York, n.d.
‘Wings of Desire’ is an amazing film, with lots of footage set in a library… No reel/real reason why I include this, it just haunts me. And here it is, at least the first part of the idea to analyze Wings of Desire (1987), which is a truly haunting film. There are so many beautiful moments in this beautiful film, including every time a child looks up and smiles in recognition of an angel. I tear up just thinking about it. None of the adults notice the angels’ presence; only the children notice them and share knowing smiles. In short, this film is special. See it now — for the first or 100th time. 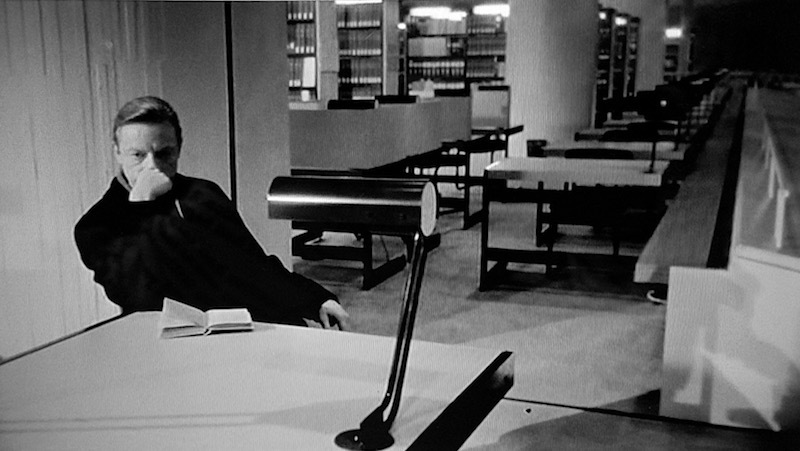 There are three short scenes set and filmed in the Staatsbibliothek zu Berlin (Berlin State Library), where angels often go to hang out with humans. Another reason to love the angels, who obviously have such good taste — and not just in overcoats! There is no reel librarian character that I could see, so this film does end up in the Class V category of films with no identifiable librarians (although Class V films might mention librarians or have scenes set in libraries). 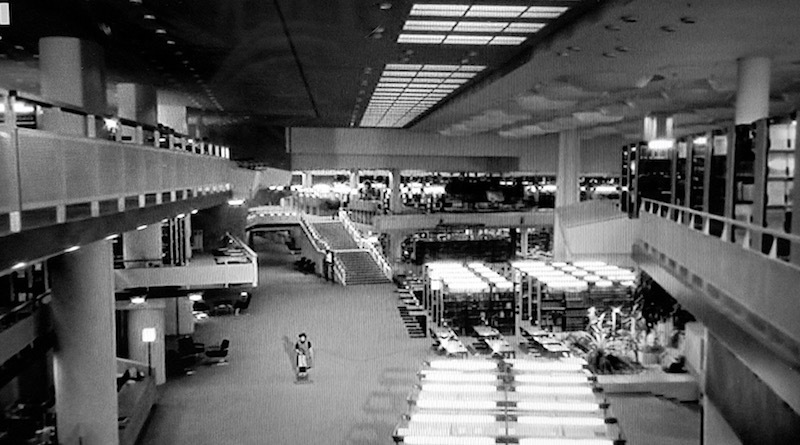 But that does not take away the significance of the library in this classic film, as I demonstrate in detail below. 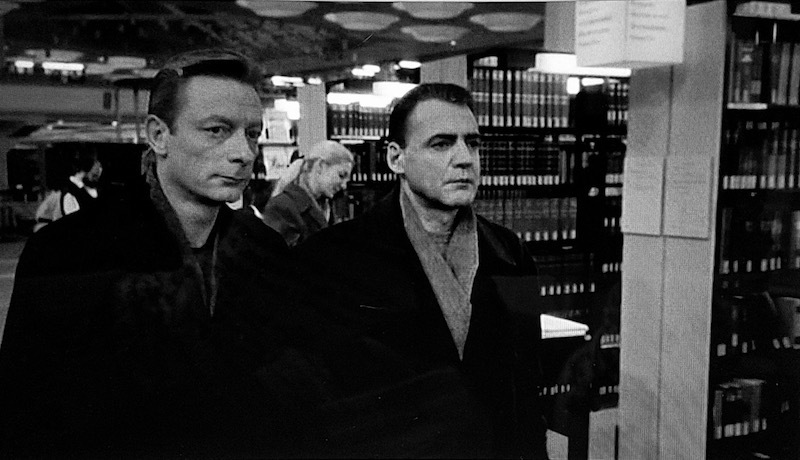 Sixteen minutes into the film, Damiel and his friend, Cassiel (Otto Sander), visit the Staatsbibliothek. The scene lasts 7 minutes in total as the angels and the camera wind their way around the shelves and different levels of this eye-catching library. The sound throughout this scene is a hushed murmuring of voices/thoughts layered on top of choir-like singing. The effect is like that of visiting a church, and indeed, this library has soaring ceilings to match the soaring vocals. The director and the angels treat this space like a sacred space. In the book The Meaning of the Library: A Cultural History, Laura Marcus argued that in Wings of the Desire, the angels’ affinity for libraries do indeed make the library a miraculous place. This is very obviously a well-used library, filled with people — and angels! — in all corners. It also showcases that a library provides space and resources for many different kinds of needs and different kinds of users. 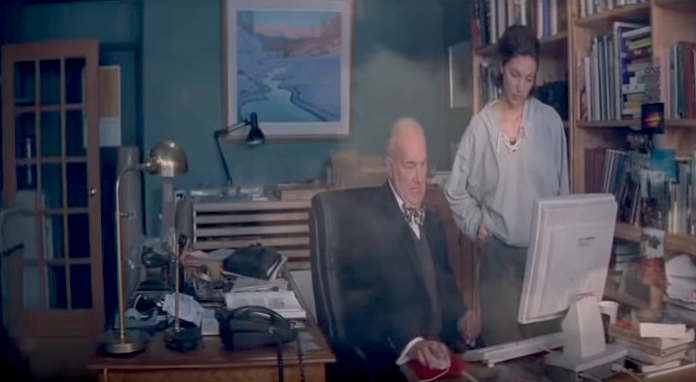 This same older man is our link to the second library scene, when at 39 minutes into the film, we revisit the man sitting at a table in the library. 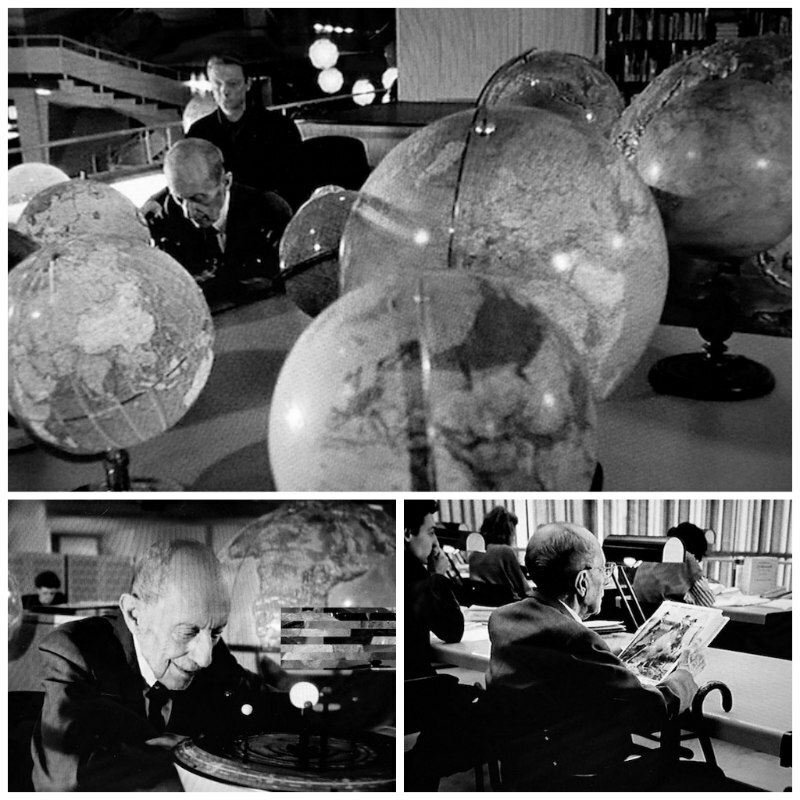 This table is filled with a collection of globes of many sizes, and he is enthralled with a rotating solar system. The camera then cuts to the old man sitting at a different table in the library, this time thumbing slowly through a large book of photos. The angel Cassiel follows the old man through the library, just as the reader does. This scene lasts only two minutes. 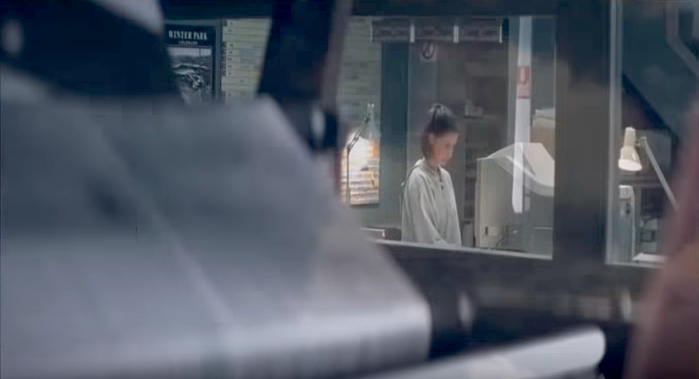 But as Marcus points out in The Meaning of the Library: A Cultural History, Wenders highlights the library as a tool of “memory and public space.” This is especially evident in this scene. The final scene in the library lasts only a minute, but it is a memorable minute. Cassiel remains in the library, but this time, the tables and desks are empty. The library is closed, the only mortals the cleaners, yet the angels still seek solace within the library walls. 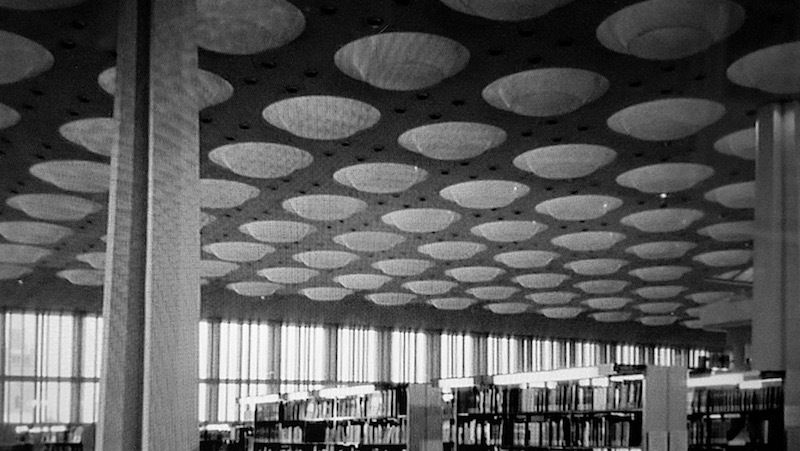 The movie was filmed on location at Staatsbibliothek in Berlin, Germany. 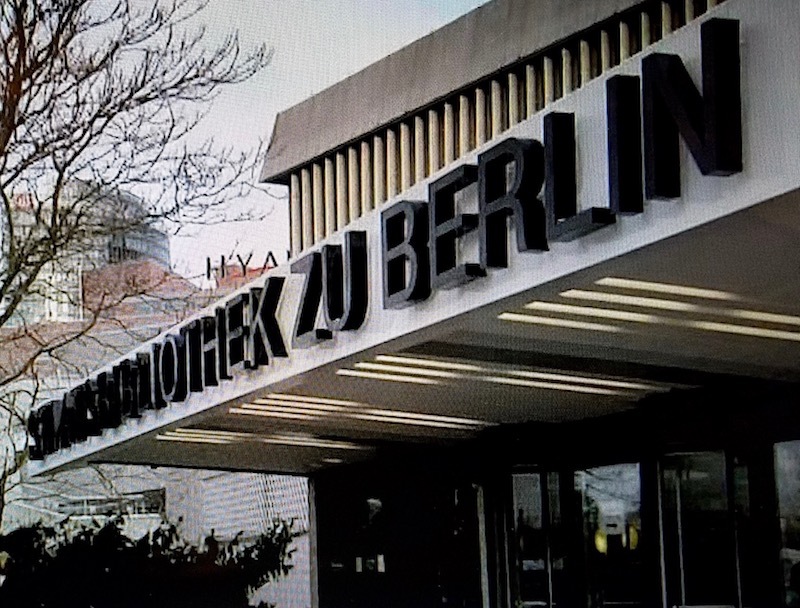 This library is also featured in two other German-language films, Agnes and His Brothers (2004) and the TV movie Götterdämmerung – Morgen stirbt Berlin (1999). 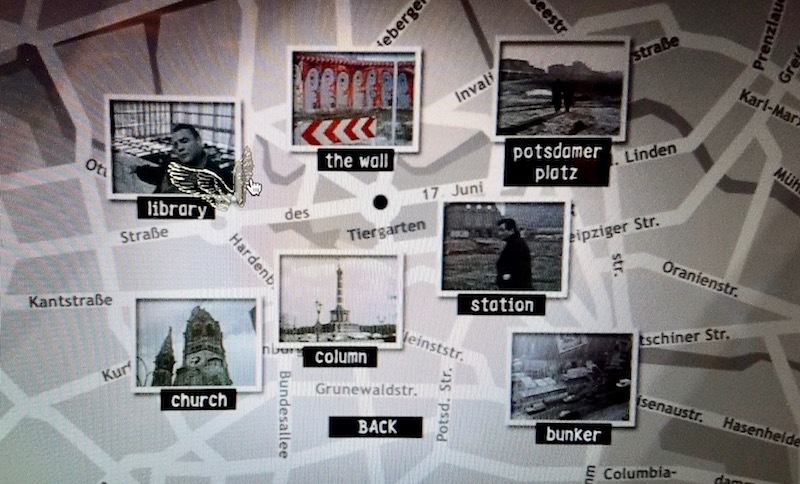 The DVD features include an interactive map that also highlights the library, as you can see in the screenshot below. Have you, too, seen the film and been haunted by its imagery? Have you seen the American remake? Please leave a comment and share! Lippold, Von Markus. “Engel, die auf Menschen starren (Angel Staring at People).” Der Tagesspiegel. 4 February 2016. Marcus, Laura. 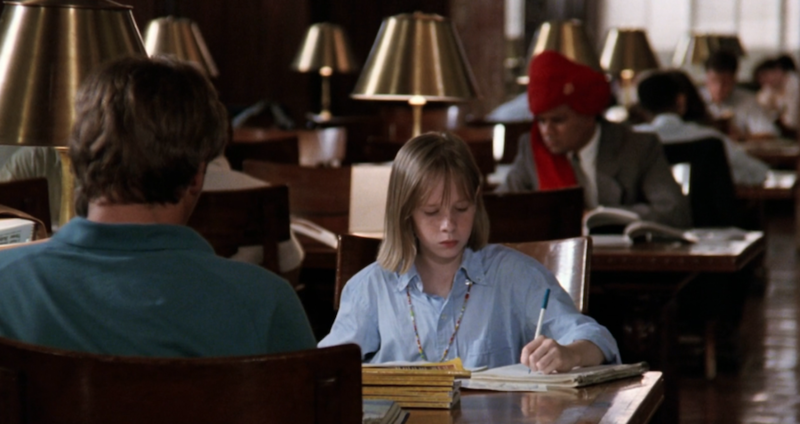 “The Library in Film: Order and Mystery.” The Meaning of the Library: A Cultural History. Princeton University Press, 2015. Rich, Jamie S. “Wings of Desire – Criterion Collection.” DVD Talk, 3 Nov 2009. Snoek-Brown, Jennifer. “City of Librarians.” Reel Librarians, 19 Oct. 2011. “Wings of Desire,” Wikimedia, is licensed under a CC BY SA 3.0 license. Wings of Desire. Dir. Wim Wenders. Perf. Bruno Ganz, Solveig Dommartin, Peter Falk. Road Movies Filmproduktion, 1987.